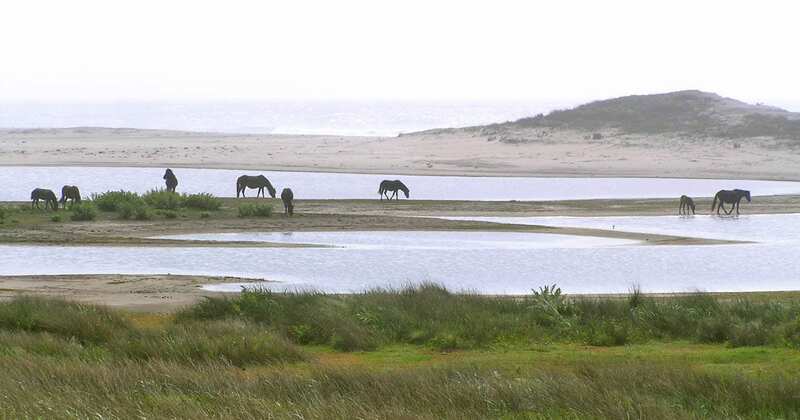 Image above: A family band of Sable Island Horses in September 2008, in the West Ponds area, with the south beach in the background. Once upon a time I went to Sable Island. Remarkable just to write those words, since actually getting to Sable Island is a rare, and coveted, occurrence. It had to do with luck. I was a member of the Read by the Sea committee casting about for a fundraiser; someone thought of Sable Island; amazingly, we got permission; we sold tickets. Four winners would spend a day on Sable Island with Zoe Lucas as guide. We realized that two committee members would need to accompany the winners — to get them to the airport, to provide the food, to make sure things went smoothly. Two of us had done the major work of the raffle; it was decided we should go. I first encountered Sable Island twenty years earlier, when my daughter received Zoe Lucas’ children’s book, with its photos of horses, as a Christmas present. A land of magic and mystery for me ever since; I had never imagined that I would ever go there. But suddenly we were making plans, contacting the charter company, making potential dates, making hotel reservations, informing the winners, communicating with Gerry Forbes at the island’s weather station, arranging for food. Of course, the first date didn’t work, weather and landing conditions didn’t cooperate. There was a second date, and a third. And then, we were in the air, six of us and the pilot, taking off from Halifax airport. That was ten years ago and many details are hazy or forgotten. Who drove to the airport? Where did we all meet up? How exactly did we arrange for food? What I will never forget is the first glimpse of that long thin curve that is Sable Island, the landing, climbing out of the plane onto the sand, being greeted by Zoe. It was more. More unique. More beautiful. More varied. More than the magic I had imagined. The background is sand and sea. Shades of white and blue. Some grasses interspersed. A pond. Dunes. Station buildings. Some vestiges of former times. This is what I remember. Hiking a dune with Zoe, every step a tale: people who had visited, names of horses we passed, snatches of island history, all background to the wonder. We walked up a dune with sea in both directions, walked past groups of horses in shades of brown, completely unperturbed by our presence. We reached the shore and walked down a beach populated by seals, equally unperturbed. Water and sand in every direction, horses, seals, birds, seven people. A world remarkable in its absences. No roads, no sidewalks, no streetlights, a few isolated clusters of buildings, us six, Zoe, a few other people who worked at the weather station. Every aspect of nature became clearer, more dramatic, more palpable. It was as if it was a world unseen, waiting to be seen, seen by so few that it hadn’t been diminished by seeing. As if we were discovering. A world more than magic. I dream of going, again. Those hours on Sable Island were a spark that ignited my curiosity. Zoe gave me permission to write an article about her Sable Island life for Saltscapes magazine. She supplied me with resources and references that I spent months reading. I learned various histories: attempted settlements, attempted tree plantings, shipwrecks, rescue station, shifting dunes, horse history, the range of research undertaken over the decades. Since then, Sable Island has become national park and many things have changed in that transition. I hope that what remains unchanged is the effort that went into protecting in order to preserve — because of many decades of such efforts we have the mystery and magic of Sable Island. Note (ZL): Since 2000, Read by the Sea has been promoting an appreciation for Canadian literature among people living in and visiting the North Shore of Nova Scotia, from Pugwash to Pictou. Based in River John, NS, Read by the Sea supports and organizes a number of programs, including a very successful annual literary festival. 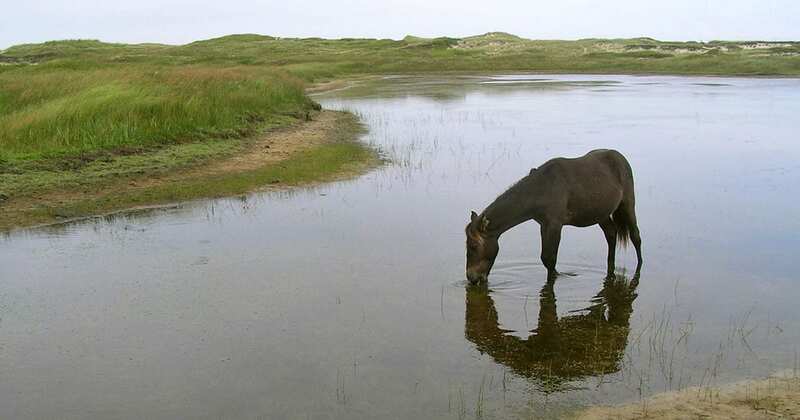 A young Sable Island horse feeding on freshwater pond vegetation, September 2008.